Did you know that we see rabbits at Glendale Animal Hospital? We love these furry creatures, who make wonderful pets. These curious, independent animals can be socialized to enjoy interaction with their owners and other pets in the household, and today, many breeds of rabbits are recognized, with variable coats, ear length and size and body conformation. Rabbits are generally not well suited to be a child’s first pet. They are easily frightened by quick movements, loud noises and changes in their environment. A high-quality rabbit pellet should be fed. Seed mixes are not appropriate, and may cause gastrointestinal upset, obesity and other disease. All of a rabbit’s teeth grow continuously. The main way the teeth are kept at their proper length is through feeding high fiber hay such as timothy, which forces the cheek teeth to grind/occlude against each other. 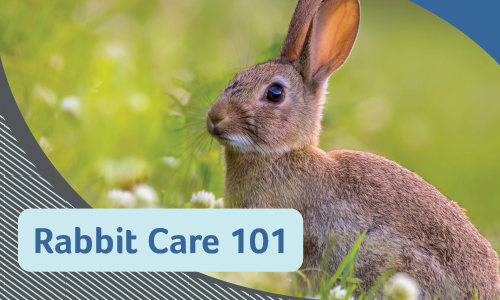 Rabbits should have routine physical exams every six months.Manifestation of a health condition is often rapid due to their fast metabolic rates, so early detection is important. Ideally, your rabbit should have an exam after purchase or adoption, and every 6 months after his or her first exam. If you’ve got a rabbit pal or are thinking of adopting one as a pet, contact us if you have any questions on care for your hare! Or if you already have a bunny and need to schedule a visit for your friend, make an appointment online today.